An exquisite Ecuador Habano wrapper leaf blankets a rich marriage of Nicaraguan binder and filler tobaccos patiently handcrafted in a striking box-pressed format in a handful of classic shapes. The medium to full-bodied profile delivers peppery notes of caramel and wood. An overriding creaminess showers the finish and sets Serie V Melanio apart in the Oliva portfolio courtesy of its rich flavor, flawless construction, and stunning aroma. 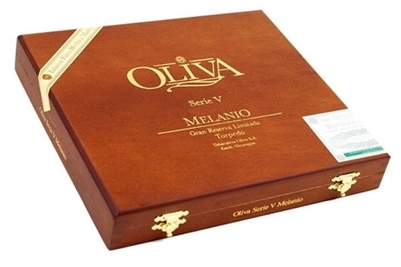 Taste the evolution of the Oliva brand with a top-shelf classic you’re guaranteed to admire.